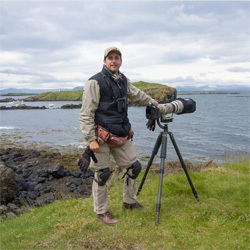 Shawn Carey (Migration Productions) produce bird/wildlife related Multi-media presentations, videos and photo workshops that have been presented all over the United States. Shawn moved for his home in Pennsylvania in 1986 to Massachusetts and started watching birds in 1988. His avid interest in photography was joined with a newfound passion for birding and he began to combine the two in 1991. By 1994 he and good friend Jim Grady started Migration Productions as a way to present their multi-image slide presentations to a live audience. Migration Productions offers the finest quality bird/wildlife programs with stunning photographs, video and sound tracks. They feature interviews with many people involved with bird watching and natural history topics. Since 1994, Migration Productions has presented its programs to camera clubs and natural history, birding organizations including Mass Audubon, Eastern Mass Hawk Watch, Hawk Mountain Sanctuary and countless others. Shawn's photos have been published in the Boston Globe, New York Times, Mass Audubon Sanctuary magazine, Science magazine, Hawk Mountain Sanctuary magazine and many others over the last 20 years. In 1997 he started teaching bird photography workshops (Fundamentals of Bird Photography) for the Massachusetts Audubon and he is an instructor for Summer Field Schools on Cape Cod for Mass Audubon Wellfleet Bay Wildlife Sanctuary.